If you are bored with boring or disturbing SMS then its time to use SMS Spam Killer a cool application which filters the incoming message in such a way that the visitor will don’t even know that he/she has got a message. It moves the message from inbox and stores in a separate place. It also filters the message based on its text content. How to configure: Run the application then select OPTION > Add filter > Correspondent filter. Select this if you would like to stop receiving messages from a particular person. Making List: Add list of Numbers and Contacts from whom you don’t want to receive any message. 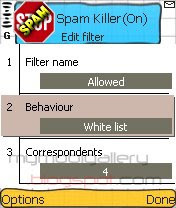 Give a name Filter name then select Black List in Behaviour then select Correspondents. Now select Options > Add person and select the contact name. You can also give a number or select a group. Allow message: Select White list from Behaviour option if you want to receive messages only from the contacts in the list. Blocked Messages: To see the Blocked messages go to Log where you can see the list of messages which has been blocked. Select Info to read the message. If you want delete all the messages which are Blocked go to Log > Options > Clear Log.